The nerve center of the book is in an old Delhi neighborhood, where Arundhati often wanders, she explained. Though she didn’t remember the details of the occasion in Jantar Mantar, she says that she might have been giving a talk to students after which she invited them to join her for tea in Jantar Mantar. There, they found an abandoned baby, and no one—none of the intellectuals or thinkers—knew how to respond. The encounter led to the birth of Anjum,a hijra, one of her novel’s protagonists. Arundhati talked about the power of fiction, which she said is “an offering, a prayer, a universe… “ When talking about Kashmir, she added that the only way to convey the reality of events unfolding in Kashmir is through the power of fiction, so readers could ask questions such as whether it’s acceptable for nation-states to conduct the kind of violence that the Indian government has launched in Kashmir. Arundhati nodded. “You’re talking about Kunan Poshpora.” Both women were referring to 1991 when Indian soldiers gang-raped more than 23 women. A podcast of Arundhati’s reading and conversation can be found on the Los Angeles library website. Listening to Arundhati brought up memories of how, 15 years ago, my journalist sister Beena Sarwar introduced me to Arundhati, and how through Anthony Arnove’s help, Arundhati participated in my Houston-based arts organization’s first Words for Peace production, a series that we created in response to 9/11. More than 400 audience members showed up at DiverseWorks, an artspace that donated space to Voices Breaking Boundaries (VBB). 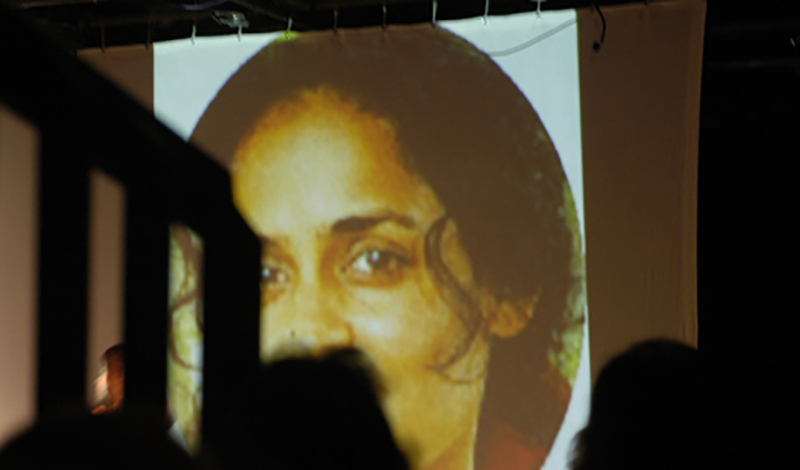 A year before Skype was launched, we used a simple speaker telephone, which we connected to a microphone, and projected images on the screen as writers Ahmed Rashid (Lahore), Irena Klepfisz (New York), Naomi Shihab Nye (San Antonio) and Arundhati Roy (Delhi) shared work from where they were based. Houston-based notable writers such as Bapsi Sidhwa and Farnoosh Moshiri read work alongside high school students, while dancer Rathna Kumar opened the evening with a performance. Many peace and justice organizations set up tables to create resistance. That week, Arundhati was on her way to New Mexico to accept the Lannan Foundation’s Cultural Freedom Prize, and was unavailable to read live from Delhi as we had scheduled. Instead, I recorded her at Houston’s Pacifica Station, KPFT 90.1 FM, the same spot where I later interviewed rock star Patti Smith several times. 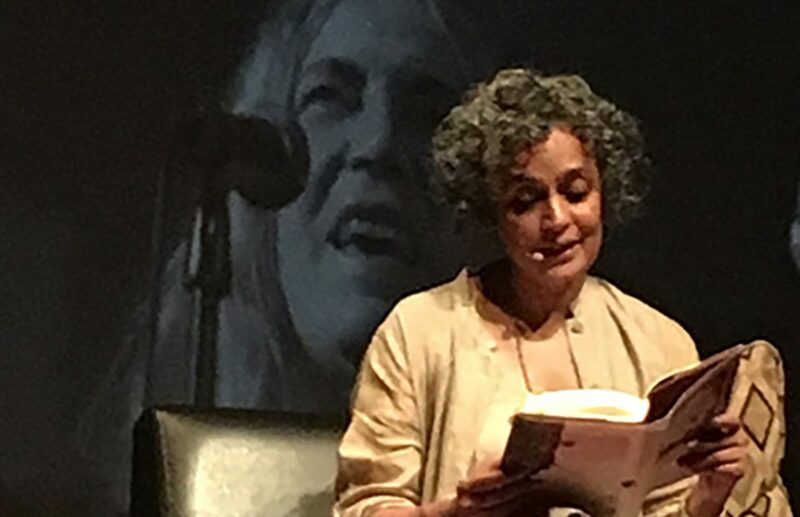 Last night, Patti’s image was projected behind Arundhati, and I was struck by how both women continue to speak out and offer resistance—and remain integral parts of my artist-activist journey. To view more images from VBB’s Words for Peace, please click here.